Welcome to the 9/11 WTC First Responders Foundation Informational Services domain Web site. 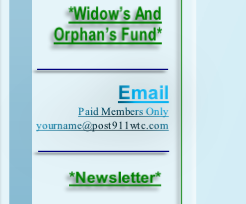 The actual Domain name registered, the 911wtcfirstrespondersfoundation.org is protected for security reasons. When typing or searching for the .org web site you are redirected to the security domain, post911wtc.com since October, 2009. This web service maintained by our main office will be updated daily as needed once the design is completed. It offers extended information to the First Responder, our members, supporters and to the general public. The web site will continuously be updated with information requested by our Responders. It is important for users to report any links that are not working properly. We are designing the ease for using this web service integrated with; interactive services, FAQ, the Foundation Forum, Live conference room with scheduled guest speakers that you can be a part of right from your desk top, our Informational cable Television “EYES ON YOU” TV Show (audience tickets free), a photo gallery which requires registration to view any photos installed, donated or shared by our members and much more. The world has witnessed the truth of bravery and dedication by the men and women of ALL categories of the workforce who have responded from each of the 50 states in the United States of America. The Spirit of America was the driving force that inspired all of our First Responders to participate in the rescue, recovery and cleanup at the World Trade Center crime scene, on September 11th, 2001. During this National State of Emergency in a time of need, NYC counted on the Spirit of America which was exemplified by all of our First Responders giving their all to keep us safe. Un-thought-of with their tireless efforts prevailed, the maintaining order in each state, searching for survivors at each terrorist target location attacked, and keeping all of our cities functioning while faced with this horrific carnage. Not only are all of our brave First Responders faced with a family crisis filled with medical and financial hardships, that for some became fatal, our communities environment has been blemished as well. Since the release of medical and research lab reports, a probable cause of thousands of individuals may also be suffering medically if toxic exposures were immune system induced, resulting from the collapse of the towers. It has been recorded that the many; Law Enforcement, Fire Fighters, EMS, National Guards, Veterans of Armed Forces, Construction workers, Red Cross, and Civilians, that were duly engaged by active or volunteer services, are now experiencing a wide range of illnesses. The 9/11 WTC First Responders Foundation strives to establish a relief fund for those First Responders and their families who assisted at the World Trade Center, Fresh Kill Landfill, Pennsylvania and Washington DC sites following the September 11th terrorist attacks and all other Homeland Disasters on American Soil, since the September 11, 2001 WTC disaster. The Foundation will generate and provide a criteria package for all eligible First Responders aiding the most serious medical status as priority one and descending to lower levels of illnesses and financial hardships with available funding as we grow and raise the funds needed for this new Not for Profit Foundation, which has been on the drawing board since 2009, broke ground with a mission and concept for its cause late 2010 and Incorporated early 2011 and will operate as a National Organization. The 9/11 WTC First Responders Foundation will make provisions for creating a Widows & Orphan’s fund, as well as education and awareness programs, that encourage the future of our children to obey and work with all Federal Government Departments, Armed Forces, Law Enforcement, Fire, and EMS laws that are enacted for our protection, following approval by the NYS Education Dept. The Foundation will also seek aid from grants, donors, medical and treatment professionals as well as pharmaceutical companies with benefit assistance. The Foundation seeks, instituting a plan for programs that will procure the needed grants and donations, for the required certification and training of responders and their families such as; support groups, symptom and diagnosis awareness, immune toxin testing awareness, nutritional needs, awareness of continuous immune system detoxification to battle induced toxins from exposure to dust at a disaster and also toxins that medications may cause while we become sick. We are also making provisions for National Preparedness Month; with seminars, to learn from the many professionals who are willing to assist such as Martial Artists for Mind, Body and Spirit, CPR, yoga exercise and basic meditation that sick responders can handle, defensive driving/awareness when to quit, peoples with disabilities awareness and rights or obtaining state privileged benefits. The 9/11 WTC First Responders Foundation intends legislatively to seek sponsorship for new bills into Government for the enactment of law and/or to modify existing laws through our future planned subsidiary 501(c)(4) not for profit 9/11 WTC FRF ACTION. Our subsidiary shall fight for the protection of; the United States, Human Rights, the U.S. Constitution of America, the future of America’s children, and a better Quality of Life as a result of gang and terrorist criminal acts, and does not preclude the protection for National Security Monitoring throughout the United States and helping to promote the Loyal Order of World Peace and the Preservation of Freedom. The Foundation shall continue to promote and support the common ground of recent laws enacted such as the HR847, S.1334, James Zadroga bill, Compensation and Health Care for First Responders that was paved by the tireless efforts of the Feal Good Foundation and other support organizations who continuously have been providing aid with their programs for our First Responders. Further, The 9/11 WTC First Responders Foundation intends to include in its mission, the same benefits and support to all American First Responders who supported America in Homeland Disaster situations by their participation. The Foundation encourages the practice for the spirit of America by brotherhood among other organizations who have the same irrespective moral views of race creed or religion; Promoting social, moral and professional integrity for the members, supporters and community which pertains to the 9/11 WTC First Responders Foundation, the American Citizen of the United States and not contrary to our Federal Government by Laws. In addition, the Foundation will promote its members to practice the common grounds of Good Fellowship among all disabled First Responders and not to preclude our War Veterans who have dedicated their time to facilitate both, physically and financially the assistance to those that are less fortunate, who have requested help through relief aid programs from various organizations, donors or grant programs that shall be permitted by law and after funds have been generated, and available as fund raising events build the base for aid with all Not for Profit organizations.